Let Us Clean and Service Your Septic System! Looking for someone to take care of your dirty work? Why hire a company that will overcharge you for service that is far under par? Call the professionals at McFarland Septic Tank Service. McFarland Septic has been serving Durham, Chapel Hill, Hillsborough, and the surrounding counties since 1983. We do everything from pumping and inspections, to repairs and new installations. 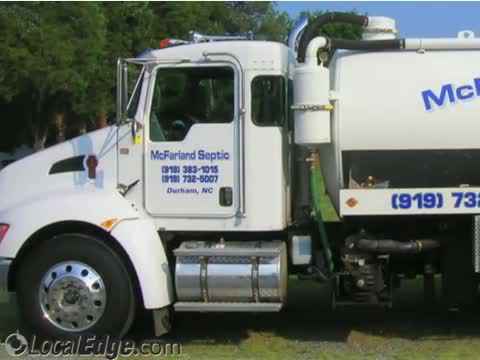 McFarland Septic provides services for residential and commercial customers alike in the Chapel Hill, NC area. McFarland Septic is fully licensed and insured and is family owned and operated. From inspections to installations, let our staff show you how expertise and dedication can prove beneficial in the end by yielding results nothing short of exemplary. McFarland Septic started out cleaning residential and commercial septic tanks. To this day we still take pride in serving our customers with fast, affordable septic tank cleaning and pumping. Our dependable equipment fleet and service staff ensures that we deliver the best possible service to all of our customers in the Chapel Hill, NC area. McFarland Septic even offers septic tank inspections for real estate transactions and other purposes. "An ounce of prevention is worth a pound of cure" has never been more true than it is today with septic tank care. A small commitment to the care of your septic system will protect you indefinitely from the nightmare created by a failing system. McFarland Septic Tank Service advocates that both your septic tank and the drain field be appropriately maintained. With cautious maintenance, the system should work correctly for years. Maintenance of your septic tank begins with water use and waste disposal habits. McFarland Septic Tank Service recommends that your family set up rules and determine which materials enter the system. Cautious maintenance will save you the pain and suffering of an expensive and lengthy fix. Let McFarland Septic Tank Service Protect Your Lawn with routine septic tank cleaning! Organic solid material floats to the surface and forms a layer of what is commonly called "scum". Bacteria in the septic tank biologically convert this material to liquid. Inorganic or inert solid materials and the by-products of bacterial digestion sink to the bottom of the tank and form a layer commonly known as "sludge". Only clear water should exist between the scum and sludge layers. It is this clear water-and only this clear water - that should overflow into the soil absorption area. People rarely think of the effect of these products on the septic tank system when the products go down the drain. What kind of effect do you think antiseptics have on your septic tank? Bacteria must be present to digest the scum. If not digested, the scum will accumulate until it overflows, clogging the soil absorption area. The sludge in the septic tank - inorganic and inert material - is not biodegradable and will not decompose. If not removed, the sludge will accumulate until it eventually overflows, again clogging the soil absorption area. Do not overload your septic system. Use water sparingly. Do only full laundry or dishwasher loads at off-peak times if possible. Do not put kitchen grease down the drain. Do not flush cigarettes, sanitary napkins, disposable diapers, or other inorganic materials down the toilet. Do not put gasoline, anti-freeze, paint thinner, pesticides, etc. down the drain. Use garbage disposal sparingly or increase septic system maintenance schedule. Check all plumbing fixtures for leaks. Ask your contractor if you think that roots are clogging your pipes. Water softener use requires increased septic system maintenance schedule. Serving: Efland NC, Durham County NC, Hillsborough NC, Madison County NC, Orange County NC, Wake County NC, Raleigh Durham Metro NC.